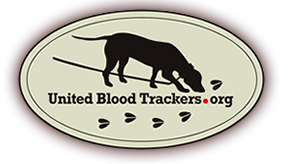 United Blood Trackers held Trackfest 2014 at the J. Robert Gordon Sandhills Field Trial Grounds near Hoffman, North Carolina, May 17-19. Participants started gathering on Friday to renew acquaintances and make new ones. Those who arrived early had the special treat of watching Andy Bensing and his superstar tracking dog, Eibe, attempt the first running of the UBT III test. The track was about 1000 yards in length, four hours in age and was laid using just 3 ounces of blood and tracking shoes. The track included a directional challenge (a three ring spiral), a surface challenge (an area of the pine plantation had recently been burned and the ground was heavily charred) and a distraction (thanks, Alan, for picking up that road killed armadillo!) We were all impressed with how steadily and easily Andy and Eibe handled the track. Over the course of the following two days, 32 participants received a variety of hands-on training and classroom presentations from the 10 UBT “staff” members in attendance. The Hit Site Seminar presented on Saturday was an especially big “hit”. Those who attended with dogs received a training line customized for their individual needs. Those attending without dogs assisted with laying lines and everyone had the opportunity to learn from each other’s experiences. The Saturday night dinner was held at Beefeaters in beautiful Southern Pines, North Carolina. As usual, UBT members came from across the country to attend. Participants hailed from Alabama, California, Georgia, Illinois, Indiana, Louisiana, Maine, Maryland, Michigan, New York, North Carolina, Pennsylvania, Texas, Virginia and Wisconsin. In addition, Canada was represented by a UBT member from Ontario. A variety of dogs was also present: two Bavarian Mountain Hounds, two Beagle mixes, a Blue Tick Coonhound, a Black and Tan Coonhound, a Mountain Cur, a hound-type mix, and a West Highland White Terrier joined nine Dachshunds for the event. There was even variety within the Dachshunds with a Smooth Dachshund and a Longhaired Dachshund joining the Wirehaired Dachshunds present. While most participants said their good-byes on Sunday evening, anxious to get home and put their new ideas into practice with their dogs, some hearty souls stayed for the challenge of testing on Monday. Eight of ten UBT-I tests and five of eight UBT-II tests were passed. Sites are already being researched for Trackfest 2015. If you have suggestions or ideas about future Trackfest locations, please feel free to contact Andy Bensing.